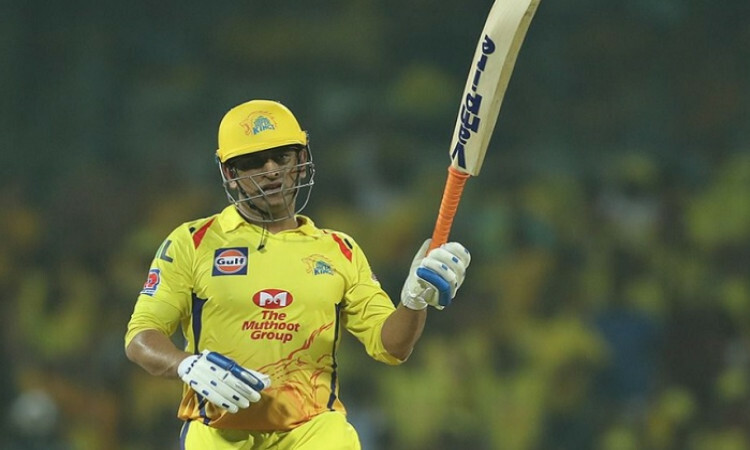 Chennai, April 1 (CRICKETNMORE): Coming in to bat at 27/3, the stage was set for a typical MS Dhoni innings at the Chepauk Stadium here and the Chennai Super Kings (CSK) skipper did not disappoint as he hit a patient 75 off 46 balls to help the team put on 175 in their 20 overs. The end result was a 8-run win for the lions in their den. Speaking after the game on Sunday, the 'Man of the Match' Dhoni once again looked at the team, rather than focusing on his own innings. Dhoni also added that he kept the dew in mind while planning his innings. Coming in, Dhoni said his first thought was to stop the fall of wickets and build a partnership. "We wanted to get a partnership going - that was needed. We knew there was some dew on the field. We knew it would get easier as the game progresses. We bat quite deep until 9 (Mitchell Santner). We could accelerate in the last few overs, and we wanted to get a partnership going at that time," he said. Commenting on giving Santner a go against the Rajasthan Royals (RR), Dhoni said: "We have a stable XI and there were a lot less left-handers in the opposition, so we gave Mitch Santner a go. It isn't that important to make changes if not necessary. As the tournament progresses everyone will get more chances." Dwayne Bravo might have conceded 19 runs from the 18th over of the RR innings, but Dhoni still showed faith in the West Indian all-rounder and handed him the ball with the team needing 12 off the last over. Dhoni said that with every game the bowlers will only get better at execution. "As the tournament progresses, bowlers start executing their plans much better. Initially I thought we would look at how the fast bowlers would bowl so we could bring in the spinners. Jadeja and Santner found it hard to grip the ball. Irrespective of the results, it is important to cut the boundaries and it is difficult for the fast bowlers to execute. It's better to keep hitting the same mark," he explained. CSK fans are known to support Dhoni and his boys to the hilt and the skipper said that he didn't mind getting the extra support at home. "The home franchise will always get more support than the opposition. That's where spirit of the game comes in - the crowd is always behind the home team. That's what makes cricket very interesting. As long as you're on the field and spending money to come and watch, I don't mind which team you're supporting," he added.